My iPhone Won't Send Pictures! Here's The Real Fix. You are at:Home»iPhone»Photos»My iPhone Won’t Send Pictures! Here’s The Real Fix. You’re trying to send pictures from your iPhone, but they won’t go through. It doesn’t matter whether you’re using Messages, Photos, or another app – nothing works. Instead, your iPhone says Not Delivered with the red exclamation point inside the circle, or your photos get stuck halfway through sending and never finish. In this article, I’ll explain why your iPhone won’t send pictures and how to diagnose and fix the problem for good. The first thing we need to do to figure out why your iPhone won’t send pictures is answer these two questions, and I’ll help you with both. Are Pictures Not Sending Using iMessage or Regular Text Messages? Any time you send or receive a text or picture message on your iPhone, it goes through as either a regular text message or an iMessage. In the Messages app, the iMessages you send show up in blue bubbles and the text messages you send show up in green. Even though they work together seamlessly in the Messages app, iMessages and text messages use different technologies to send pictures. iMessages are sent using Wi-Fi or the wireless data plan you purchase through your wireless carrier. Regular text / picture messages are sent using the text messaging plan you purchase through your wireless carrier. When your iPhone won’t send pictures, the problem is usually with text messages or iMessages — not with both. In other words, pictures will send with iMessages, but won’t send with text / picture messages — or vice versa. Even if you do have a problem with both, we need to troubleshoot each problem separately. To find out whether your iPhone is having a problem sending messages with iMessages or text messages, open the Messages app and open up a conversation with someone you can’t send pictures to. If the other messages you’ve sent that person are in blue, your iPhone won’t send pictures using iMessage. If the other messages are in green, your iPhone won’t send pictures using your text messaging plan. Are Pictures Not Sending To One Person, Or Everyone? If pictures won’t send using to someone using iMessage, send a test picture to someone else who uses iMessage (blue bubbles). If you pictures won’t send using your text / picture messaging plan, send a test picture to someone else whose messages go through as text messages (in green bubbles). 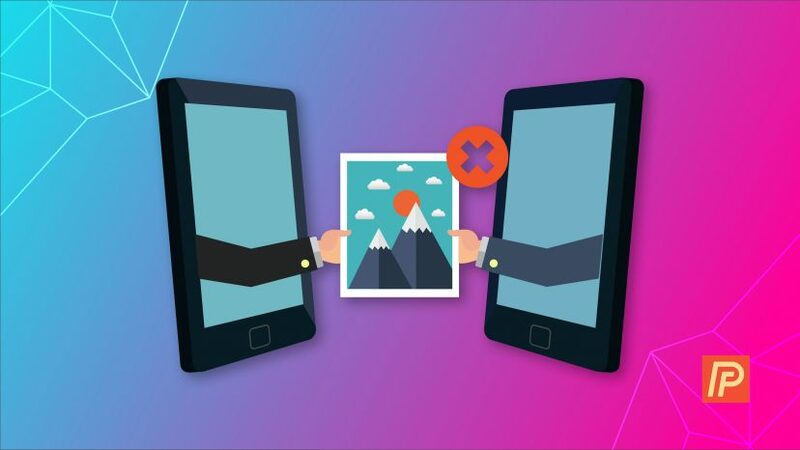 As a rule of thumb, if a picture won’t send to just one person, the problem is on their end and they may need to change something on their iPhone or with their wireless carrier to fix the problem. If you iPhone won’t send pictures to anyone, the problem is on your end. I’ll give you solutions for both scenarios below. iMessages are sent over your iPhone’s connection to the internet, so the first thing we’ll do is test your iPhone’s connection to the internet. The easiest way to do this is to try sending a message using your wireless data plan and then try sending a message when your iPhone is connected to Wi-Fi. If your iPhone is connected to Wi-Fi and your iPhone won’t send pictures, go to Settings -> Wi-Fi and turn off Wi-Fi. Your iPhone will connect to the cellular data network, and you should see LTE, 4G, or 3G appear in the upper left-hand corner of the screen. Try sending the picture again. 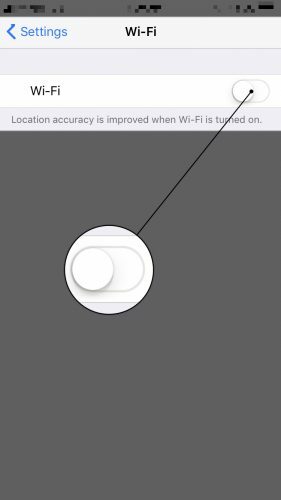 If it goes through, the problem lies with your Wi-Fi connection, and I’ve written an article that explains what to do when your iPhone won’t connect to Wi-Fi. Don’t forget to turn Wi-Fi back on when you’re done! If your iPhone won’t send pictures when it’s not connected to Wi-Fi, go somewhere that has Wi-Fi, connect to the Wi-Fi network in Settings -> Wi-Fi, and try sending the message again. If the message goes through, the problem is probably with your iPhone’s cellular data connection. 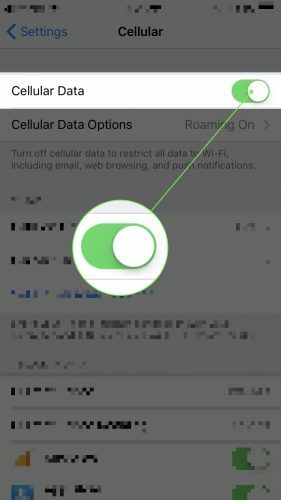 Go to Settings -> Cellular and make sure the switch next to Cellular Data is turned on. When you’re not connected to Wi-Fi, iMessages are sent using your wireless data plan, not your text messaging plan. If Cellular Data is turned off, the pictures you send as text / picture messages will go through, but the pictures you send as iMessages will not. 3. Does The Other Person Have iMessage Turned On? I recently worked with a friend whose messages weren’t going through to her son after he got a new, non-Apple phone. It’s a common problem that happens when someone switches to an Android smartphone but doesn’t sign out of iMessage. Here’s the situation: Your iPhone and the iMessage server think that person still has an iPhone, so they try to send pictures using iMessage, but they never go through. Fortunately, there’s a simple way for them to sign out of iMessage and solve the problem for good. Tell them to follow this link to Apple’s support page where they can disable iMessage by sending themselves a text message and typing in a confirmation code online. An inadvertent change in the Settings app can cause connection problems that can be tricky to diagnose, but there’s a good way to fix them all at once. 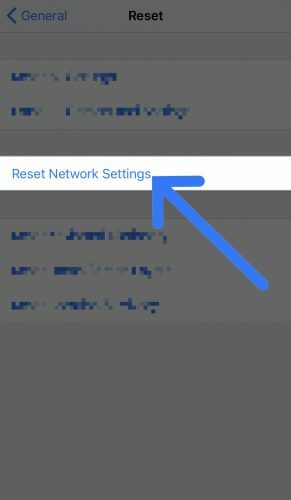 Reset Network Settings is a great way to reset just those settings that affect the way your iPhone connects to Wi-Fi and the cellular network, without affecting any of your personal information. You will have to reconnect to your Wi-Fi network again, so make sure you know the password before you move on. To reset the network settings on your iPhone, go to Settings -> General -> Reset -> Reset Network Settings, enter your passcode, and tap Reset Network Settings. Try sending another test message after your iPhone reboots to see if the problem was resolved. If you’re still having problems after you’ve followed these steps, skip to the section called If Your iPhone Still Won’t Send Pictures. We’ve already discussed the two types of messages that are sent using the Messages app: iMessages and text / picture messages. And, to make things more complicated, there are also two types of text / picture messages. SMS is the original form of text messaging that only sends short amounts of text, and MMS, which was developed later, is capable of sending pictures and longer messages. If MMS is turned off on your iPhone, regular text messages (SMS) will still go through, but pictures will not. 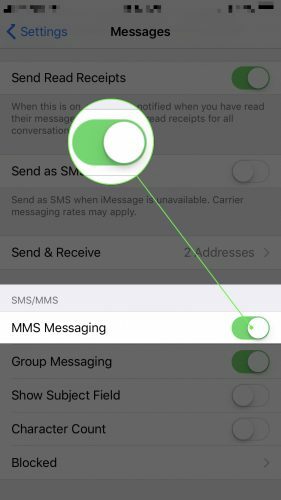 To make sure MMS is turned on, go to Settings -> Messages and make sure the switch next to MMS Messaging is turned on. Unfortunately, when it comes to problems with your iPhone’s connection to your wireless carrier, you may need to contact them for help. Customer account issues and technical outages can cause MMS messages not to be delivered, and the only way to know for sure is to call and ask. The easiest way to find out what number to call is to search Google for “your wireless carrier (Verizon, AT&T, etc.) wireless customer support number”. For example, if you Google “Verizon wireless customer support number”, you’ll find the number at the top of the search results. 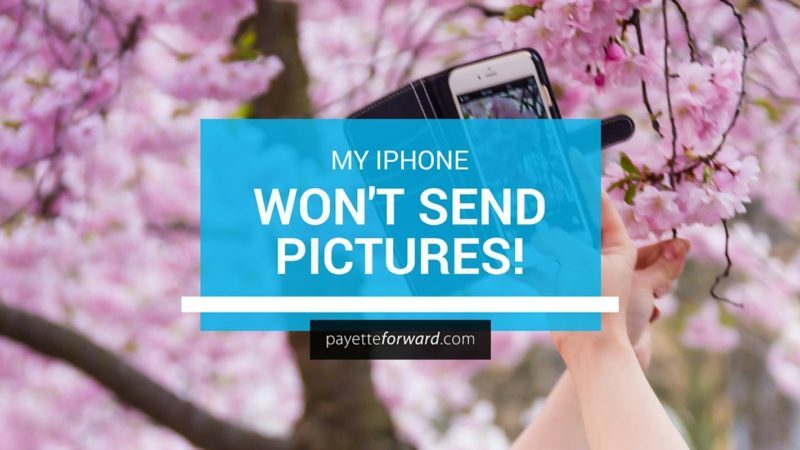 If you still can’t send pictures with your iPhone, my advice on how to proceed depends upon whether you can’t send pictures to just one person or you can’t send them to anyone. If you can’t send pictures to just one person, ask them if they can receive iMessages or text / picture messages from anyone. Remember, they may be able to receive iMessages but not text / picture messages, or vice versa. Your best bet is to share this article with them and have them go through the troubleshooting steps themselves. If you think the problem is on your end, here’s what to do next: Delete your conversation with them in the Messages app, delete their contact from your iPhone, and follow the instructions above to Reset Network Settings. After your iPhone reboots, type their phone number into the Messages app and try sending them a picture message. If it goes through, add their contact information again and you’re good to go. If that still doesn’t work, you may need to back up your iPhone to iCloud or iTunes, restore your iPhone, and then restore your data from the backup. Restoring your iPhone erases everything on it and reloads the software, a process that can solve all sorts of software issues. I recommend you do a DFU restore, which is a special type of restore that Apple techs use at the Apple Store. I’ve written an article that explains how to DFU restore your iPhone. Now that your iPhone is sending pictures again, go ahead and send some pictures to your family and friends. But be careful: I know someone who tried to send a picture of his Christmas tree in a group text to his entire family, but accidentally ended up sending else. It was an awkward Christmas. I’d like to hear about your experiences figuring out why you couldn’t send pictures on your iPhone in the comments section below, and I’ll be here to help along the way. Previous ArticleWhy Does Facebook Keep Crashing On My iPhone and iPad? The Fix! Next Article My iPhone Zoomed In And Won’t Zoom Out. Here’s The Fix!